During Holy Week (one week prior to Easter), it is customary for Italian Roman Catholic women to prepare baked goods for the upcoming feast on Sunday. Finally, on Easter Sunday, Southern Italians make a gran finale with homemade ricotta cake. This chocolate ricotta cake is one of my traditional recipes. Just mix all ingredients together and bake the cake – that’s it. It’s chocolaty and moist. 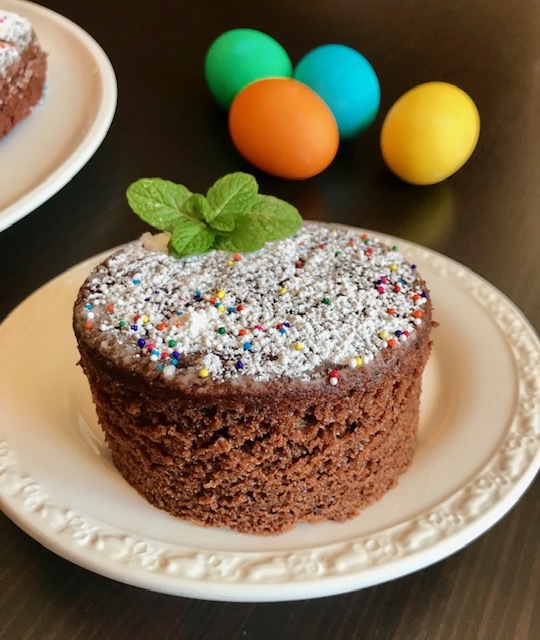 Enjoy this dessert at Easter! 2. Combine the flour, baking powder, salt & ground cinnamon in a bowl; set aside. 3. Butter and lightly flour a 9-inch spring form pan; set aside. 4. In a large mixing bowl, whisk together the melted chocolate, sugar, egg, oil, ricotta cheese, milk and vanilla extract until smooth. 5. Gradually (a little at a time), whisk in the combined dry ingredients. Keep mixing until the batter is smooth and thick. 6. Pour the batter into prepared spring form pan, cleaning sides of bowl with a rubber spatula. 7. Transfer the cake pan on a rack set in center of oven. 8. Bake cake for 25 minutes. After 25 minutes, insert a pointed knife in center of cake. If knife comes out clean, the cake is done. If not, bake cake for an additional 5 to 8 minutes. Test once more (the cake should be done). If not, bake a few minutes more and test again. 9. Transfer the cake to a counter to cool for 15 to 20 minutes. 10. When cake is cool, using a knife, gently loosen the cake from sides of pan and remove. 11. Place the cake on a serving platter. 12. Dust top of cake with powdered sugar and nonpareils. Garnish each serving with mint leaf sprigs. 13. Serve this cake by itself or with a dollop of Chantilly Cream (recipe is in The Kitchen Buzzz’s Recipe index).